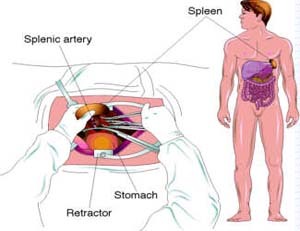 A splenectomy is a procedure that involves the removal of the spleen by operative means. The spleen, similar in structure to a large lymph node, has historically held rather a mythical role but current knowledge of its purpose includes the destruction of old red blood cells and platelets and the detection and fight against certain bacteria. The spleen is enlarged in a variety of conditions such as malaria, glandular fever and most commonly in “cancers” of the lymphatics such as lymphomas or the leukaemia. In general, spleens are removed by laparoscopy (minimal access surgery) when the spleen is not too large and when the procedure is elective. It is performed by open surgery for trauma or large spleens. Both methods are major surgeries, and are performed under general anesthesia. The spleen is located and disconnected from its arteries. The ligaments holding the spleen in place are dissected and the spleen is removed. When indicated a drain is left in place and the incision(s) is closed. If necessary, tissue samples are sent to a laboratory for analysis. Because splenectomy causes an increased risk of overwhelming sepsis due to encapsulated organisms (such as S. pneumoniae and Haemophilus influenzae) the patient should be immunized, if possible, prior to removal of the spleen; see asplenia for advice. Failure to do so later puts the patient at risk of overwhelming post-splenectomy infection (OPSI), a potentially rapidly fatal septicaemia. These bacteria often cause a sore throat under normal circumstances but after splenectomy, when infecting bacteria cannot be adequately opsonized, the infection becomes more severe. Following splenectomy, the platelet count may rise to high levels in blood leading to an increased risk of clot formation and death.